List of Contributors. Preface. G.D. Watkins, EPR and ENDOR Studies of Defects in Semiconductors. J.M. Spaeth, Magneto-optical and Electrical Detection of Paramagnetic Resonance in Semiconductors. T.A. Kennedy and E.R. Glaser, Magnetic Resonance of Epitaxial Layers Detected by Photoluminescence. K.H. Chow, B.Hitti and R.F. Kiefl, uSR on Muonium in Semiconductors and its Relation to Hydrogen. K.Saarinen, P.Hautojarvi, and C. Corbel, Positron Annihilation Sprectroscopy of Defects in Semiconductors. R. Jones and P.R. Briddon, The Ab Initio Cluster Method and the Dynamics of Defects in Semiconductors. Subject Index. Contents of Volumes in This Series. 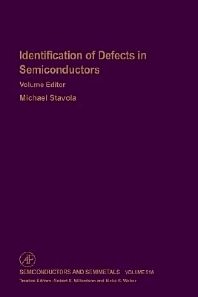 Since its inception in 1966, the series of numbered volumes known as Semiconductors and Semimetals has distinguished itself through the careful selection of well-known authors, editors, and contributors.The"Willardson and Beer"Series, as it is widely known, has succeeded in publishing numerous landmark volumes and chapters. Not only did many of these volumes make an impact at the time of their publication, but they continue to be well-cited years after their original release. Recently, Professor Eicke R. Weber of the University of California at Berkeley joined as a co-editor of the series. Professor Weber, a well-known expert in the field of semiconductor materials, will further contribute to continuing the series' tradition of publishing timely, highly relevant, and long-impacting volumes. Some of the recent volumes, such as Hydrogen in Semiconductors, Imperfections in III/V Materials, Epitaxial Microstructures, High-Speed Heterostructure Devices,Oxygen in Silicon, and others promise indeed that this tradition will be maintained and even expanded.Reflecting the truly interdisciplinary nature of the field that the series covers, the volumes in Semiconductors and Semimetals have been and will continue to be of great interest to physicists, chemists, materials scientists, and device engineers in modern industry.